Seabury's program centers on the development of the whole child- intellectual, social, emotional and physical. We immerse our students in experiences that engage their minds, their creativity, their sense of wonder and their imagination. 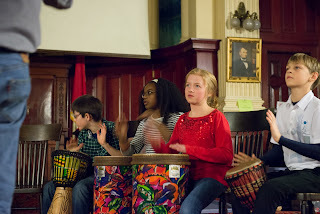 Performing arts at Seabury is a place where these converge in amazing ways. At the lower school, students don't simply learn to read music and sing songs together. They explore ideas such as, "Where does inspiration come from?" and collaborate to create plays written by students with music and choreography also created by students. The middle school's focus on using the community as the classroom extends to performing arts with guest artists coming in and extending the integrated curriculum into the arts. Our summer program and after school programs give students opportunities to explore drama, improvisation, music and more. 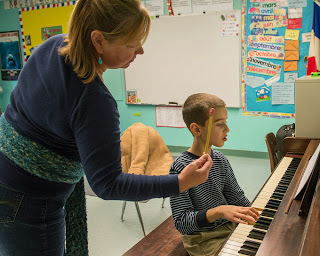 Our relationship with local private piano and voice teachers allow students to pursue music learning at school. And, of course, Seabury's performing arts would not be complete without the traditional "Seabury on Stage- SOS" at Friday Gathering! We are always thrilled to see our students perform, and I encourage you to join us for our winter and spring showcases to see what our children have been up to. But I must confess that my favorite thing about performing arts is to watch the process of creative collaboration happen in the classroom. The excitement as inspiration strikes, the challenge of working through a "difference of opinion" about how a particular piece should go, the teamwork required to dance or act or sing together- they not only create great performances. They are life lessons for our children. A huge thank you to lower school performing arts teacher, Jessica Blackwood for re imagining the program and creating opportunities for our students to "do" performing arts rather than just learn about them. Thanks to the middle school staff for exposing our students to a wide range of artists and performance opportunities, and for giving our students the opportunity to work with adults in their school and from their community who are inspired and inspire others. Thank you Marion Head and our teachers and coaches for developing an after school program that gives students a wide range of experiences to explore, and to Caitlin Webb and summer teachers for putting together Summer at Seabury experiences that include the arts in fun and exciting ways. Thank you to Suzanne Messinger and Janina Beran for providing piano and voice lessons at Seabury. And especially thank you to our kids, who share their joy for learning and creativity, and who inspire us each and every day.